Recursion is expressing an entity in terms of itself. In C programming, recursion is achieved using functions known as recursive function. Recursive functions are very powerful in solving and expressing complex mathematical problems. Until now, we called a function from another function. However, C language allows a function to call itself known as Recursive function. In above example, main() function is executed first, it calls recursive_function(). The recursive_function() executes some code and call itself. The process continues i.e. calling of recursive_function() function from recursive_function() itself and behaves as an infinite loop. Finally, execution of above program terminates in a crash. In C programming, every function call causes C runtime to load function local variables and return address to caller function on stack (memory). Each recursive call will load a fresh copy of local variables and return address to stack. In above recursive_function() there is no local variable, however return address to caller function is loaded to stack for each function call. Since memory is a limited resource, loading of return addresses indefinitely will result in memory shortage. In this situation, OS will either allocate more memory for our program or will terminate the program abnormally. Which is what happened in our first recursive program. A function must not go in indefinite recursion. Every recursive function must have a base condition to terminate (similar to the loop termination condition). For example, let us redefine our first recursive function with a base condition and a meaningful example. Let us write a C program to print all natural numbers in reverse from n to 1 using recursive function. To write such function let us set a base condition. According to our program, base condition is n <= 0. If the condition n <= 0 is met, then no recursive call should be made. Let us take a note on above program. The program execution starts from main() function. It calls print() function with n=5. 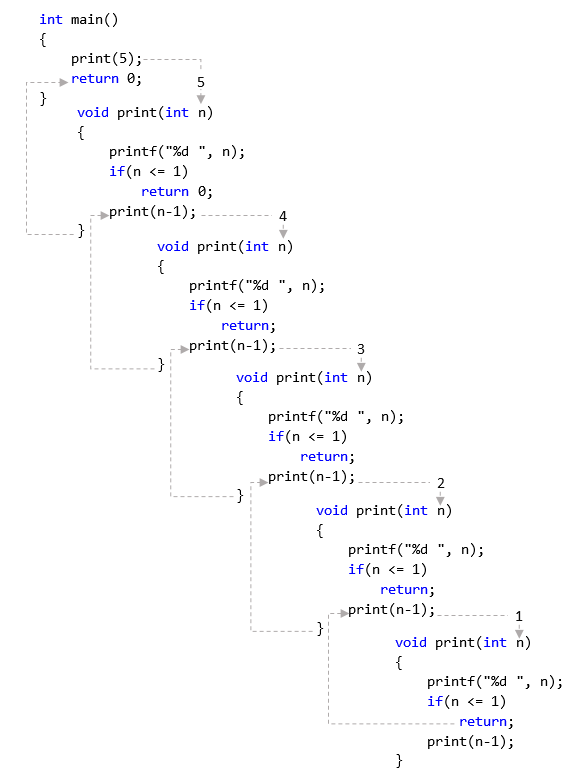 Inside the print() function the first statement prints value of n (i.e. 5 for first function call). After printing the value of n, a condition is checked if(n <= 1), then terminate from the function without executing below tasks. If the condition (n <= 1) is false, then a recursive call to print() function is made with decreased value of n (i.e. 4 if n=5). print() function is executed again with n=4 and step 2 to 4 is repeated till n=1. The following image explains entire program flow control through recursive calls. Using recursion many complex mathematical problems can be solved easily. Using recursion, a problem can be solved in less number of programming construct, compared to its iterative counterpart. Due to incremental functional call, it consumes more memory and takes more time than its iterative approach. Recursive programs may crash due to stack overflow (memory shortage) errors. Recursive functions are complex to read, write and understand. Bugs in a recursive function are difficult to trace and remove. Although recursive functions are complex to write and debug, I recommend to use recursive function if your problem can be divided into sub-problems. Avoid use of recursion if memory is a big constraint. C program to find factorial using recursion. C program to find GCD using recursion. C program to find sum of digits using recursion. C program to find sum of array elements using recursion.